Jun. 29, 2017 8:35 a.m. Waiting for hours as B.C. road crews clear a highway crash could be a thing of the past, if one Lower Mainland community has its way. 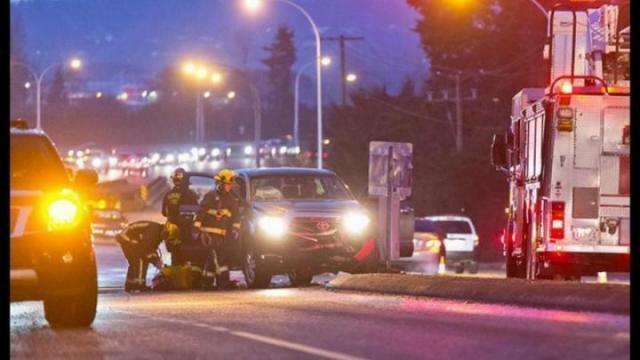 The District of North Vancouver is getting ready to ask the provincial government to review what it sees as onerous requirements to investigate crashes. The North Shore’s geography doesn’t help, Moxon added. Accessible by only two bridges from Vancouver in the south and funnelled onto just one highway going north, the area lacks alternate routes to avoid traffic jams. During the last month alone, DriveBC reported at least a dozen accidents that closed one or more lanes, stalling traffic for hours. District staff plan to suggest a three-pronged solution at the Union of B.C. Municipalities convention this fall. Currently, only police are allowed to clear crashes and fill out investigation reports, and they must investigate when the damage is worth more than $1,000. The idea is for the province to update its legislation and allow fire departments to clear minor crashes, fill out the reports, and raise the monetary cap where police must be involved to $10,000. According to ICBC statistics, North Vancouver had 704 car accidents between 2011-2015. Of those, 426 involved no injuries and were likely contenders for a police-free response. The idea was inspired by pilot projects in Surrey and Kamloops. Surrey’s firefighters have been clearing minor crashes and filling out investigation reports for more than a decade. Fire Chief Len Garis said the initiative has helped ease congestion immensely, especially since the city is criss-crossed by highways. ICBC numbers show that Surrey saw 912 crashes between 2011-2015. Of those, 443 wre property-damage only, likely contenders for a police-free approach. He said fire crews also used the information to help make roads safer. B.C. cities are set to vote on the idea at the UBCM convention in September. More than anything, Moxon said she hopes the push will get the conversation going.